Performance Time: Approximately 30-45 minutes, 34 pgs. HOLIDAY WITH MUSIC. Adapted from the play Make Believe by A. A. Milne. Mr. and Mrs. Hubbard, a poor, childless couple, have only their nine imaginary children to keep them company. 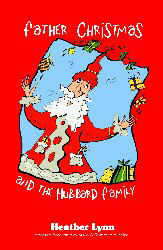 Each year, the Hubbards eagerly await Christmas hoping that Father Christmas will bring them a child. When the Hubbards receive an invitation to appear at Father Christmas’s court, they are overjoyed. There, the Hubbards meet Father Christmas and his other guests, who include Bluebeard the pirate, Robinson Crusoe, Goldilocks, and Red Riding Hood. To make up for the years he has neglected the Hubbards, Father Christmas presents them with nine special gifts. Filled with humor and whimsy, this play is a true holiday delight and includes several Christmas carols.